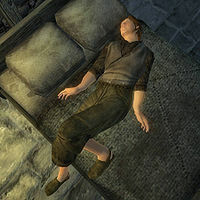 Bradon Lirrian was a Breton commoner who lived in Bruma with his wife Erline until he was killed recently by the vampire-hunter Raynil Dralas. Trying to loot his corpse repeatedly will result in a bounty, since his body is involved in an investigation. Rumors are spreading that he was a vampire, Erline is convinced it isn't true, while Carius is. You'll uncover the truth during the related quest. He wore a pair of sack cloth pants, a coarse linen shirt along with a pair of clogs. He also had a small amount of gold. Somewhat surprisingly Bradon has a full schedule, although obviously it is never used. He was supposed to sleep from midnight to 6am and eat two meals in his house: one from noon to 2pm and one from 6pm to 8pm. At 8pm he was intended to take an evening walk around Bruma for four hours, centered on the area outside the Hammer and Axe. Outside those times he stayed in his house. The AI package intended to give Bradon his evening constitutional is called SergeLirrianWanderExterior20x4, indicating that his original name was going to be "Serge".